Suicide Squad rolls out new trailer! - Hello! Welcome to my blog! Here we go guys! New trailer from the squad! Watching this new clip certainly makes it feel so good to be bad. A team of the world’s most dangerous, incarcerated Super Villains, provide them with the most powerful arsenal at the government’s disposal, and send them off on a mission to defeat an enigmatic, insuperable entity. The movie is from the director David Ayer (“Fury”), it stars Oscar nominee Will Smith (“Hancock”), Oscar winner Jared Leto (“Dallas Buyers Club”), Margot Robbie (“The Wolf of Wall Street”), Joel Kinnaman (“RocoCop”) and Oscar nominee Viola Davis (“Doubt”). Now don't get me started on Margot Robbie, I just love her! 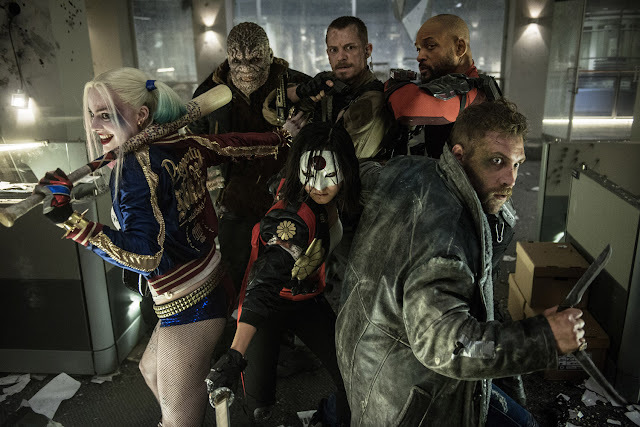 Suicide squad are characters based from DC Comics, the film also stars Jai Courtney (“Insurgent”), Jay Hernandez (“Takers”), Adewale Akinnuoye-Agbaje (“Thor: The Dark World”), Ike Barinholtz (“Neighbors”), Scott Eastwood (“Fury”), Cara Delevingne (“Paper Towns”), Adam Beach (“Cowboys & Aliens”), and Karen Fukuhara in her feature film debut. Based on the trailers I saw, the plot is, U.S. intelligence officer Amanda Waller has chosen these unlikely heroic group of despicable individuals with next to nothing to lose will do as a solution to one of their problems. However, once they realize they weren’t picked to succeed but chosen for their patent culpability when they inevitably fail, will the Suicide Squad resolve to die trying, or decide it’s every man for himself? Warner Bros. Pictures presents, an Atlas Entertainment production, a film by David Ayer, “Suicide Squad.” Opening across the Philippines in 3D, 2D, and select IMAX 3D theaters on August 4, “Suicide Squad” distributed worldwide by Warner Bros. Pictures, a Warner Bros. Entertainment Company.